From a traveler's perspective, Nürnberg — Bavaria's second city — has it all: excellent museums, thought-provoking history, glorious red-sandstone Gothic architecture, and a charming Old Town encircled by a nearly intact medieval wall. It also boasts Germany's largest (and most famous) Christmas market, along with the country's tiniest (and most beloved) sausage. Nürnberg was one of Europe's leading cities around 1500. Its large Imperial Castle marked it as a stronghold of the Holy Roman Empire. In the Middle Ages, Holy Roman Emperors stayed here when they were in town. While this huge complex has 45 buildings, only a few (including the church, living quarters, well, and tower) are open to the public. The part that housed the stables and stockpiles of grain is now a youth hostel. At the center of town is the Hauptmarkt. This main market square was built by Holy Roman Emperor Charles IV to unite what were previously two separate walled cities. Its centerpiece is the pointy gold Beautiful Fountain, which brought in clean drinking water — necessary since medieval tanneries, slaughterhouses, and the hospital dumped their byproducts into the river. Today the Hauptmarkt is lively with fruit, flower, and souvenir stands. 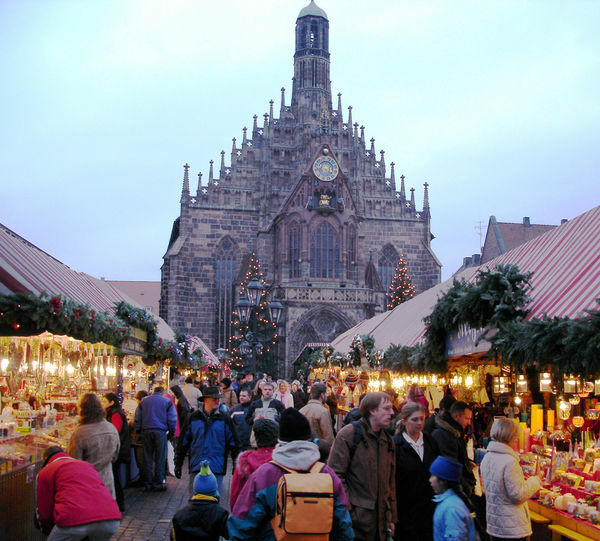 In December, it hosts Germany's grandest Christmas market. About a block from the Hauptmarkt are two good places to try Nürnberger, the city's famous pinkie-sized bratwurst. Nürnbergers — the people — insist that size doesn't matter; they maintain that "in der Kürze liegt die Würze" (in the shortness lies the tastiness). The popular restaurant Bratwursthäusle is a great place to sample "3 im Weckle" (three Nürnberger bratwurst in a blankie). The family-run Schwarz Bakery selects the best wursts and breads from producers in the surrounding countryside, and brings the bounty into the city. South of the Hauptmarkt is one of my favorite museums in Germany — the Germanic National Museum. 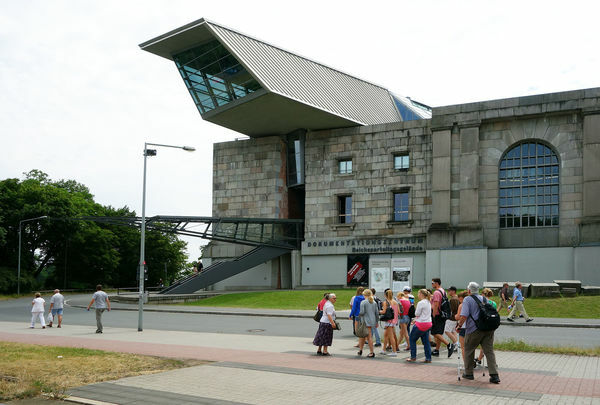 Dedicated to the cultural history of the German-speaking world, this museum is highlighted by its German art collection, which includes works by Lucas Cranach the Elder and the only original Albrecht Dürer paintings in town. It also has the world's oldest surviving globe and a monastery filled with original statues from the city's bombed-out churches and fountains. While the turn of the 15th century marked the city's peak, the 20th century was its lowest point. By the end of World War II, 90 percent of the Old Town was destroyed, and of its 200 churches, only one escaped the bombs. Fortunately, much of Nürnberg's art was saved from destruction. Recently, I had the thrill of touring the Historic Art Bunker, a series of cellars used by the Nazis to store masterpieces in anticipation of Allied bombing. Rich in art, Nürnberg had long been known as the "treasure chest of the German Empire." The pieces stored here included regalia of the Holy Roman Empire and the city's own treasures, such as the tabernacle from the grand St. Lawrence Church, as well as all of that church's stained glass. While much of Nürnberg's Old Town sightseeing centers on the "First Reich" (the Holy Roman Empire), several sights outside the town center are dedicated to the Third Reich. Those curious about this dark period can visit Hitler's vast Nazi Party Rally Grounds and learn more at the excellent Nazi Documentation Center. When Hitler took power in 1933, he made Nürnberg the site of his Nazi Party Rallies — elaborate celebrations of Nazi culture, ideology, and power. To host the proceedings, he and architect Albert Speer designed massive buildings in Hitler's preferred style: stark, huge, and Neoclassical. But only a few of the plans were completed before war broke out. Today, it's possible to walk around the still-unfinished remains of Hitler's megalomaniacal super-structures, including Zeppelin Field, where Hitler addressed his followers, and the never-completed Congress Hall. Inspired by Rome's Colosseum, it was to be big enough to accommodate an audience of 50,000. The Documentation Center — housed in a small wing of the Congress Hall — is sometimes called "a spear through Speer," as the modern annex slices diagonally through the middle of the Speer-designed building. Just like post-WWII doctors didn't want to take advantage of medical knowledge gained through Nazi torture, modern architects didn't want to utilize anything the Nazis had built here. Visitors to Europe's Nazi and Holocaust sights inevitably ask the same question: How could this happen? Nürnberg's Documentation Center does its best to provide an answer. It meticulously traces the evolution of the National Socialist (Nazi) movement, focusing on how it both energized and terrified the German on the street. The center frankly analyzes the Nazi phenomenon, to understand how it happened — and to ensure it never happens again. 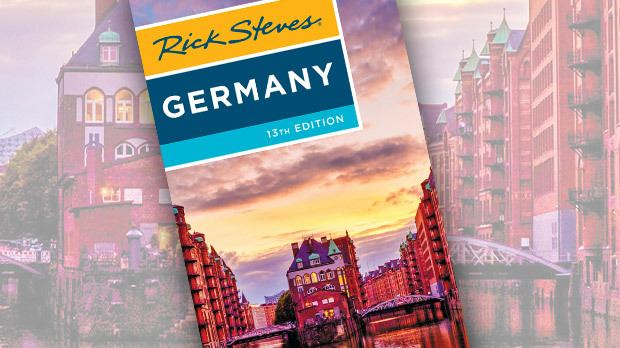 Whether you're a historian or just a curious traveler, Nürnberg has much to teach and much to offer — from its cuisine, bustling markets, and appealing architecture to its fascinating sights.